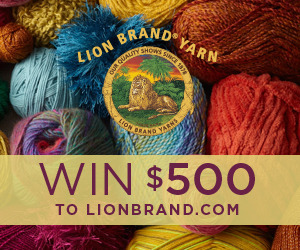 Lion Brand Yarn Company is running a story contest through an app on the company’s Facebook page (http://www.Facebook.com/LionBrandYarns). Entrants must write a story of 500 words or less answering the question, “What is the most meaningful handmade gift you have ever given or received?” Last day for submissions is April 14th, and Facebook fans will vote on their favorite essays. The grand prize winner will win a $500 credit to LionBrand.com. In addition, four weekly winners chosen randomly will receive a $50 credit to LionBrand.com. “We know that one of the main reasons our community knits and crochets is to create handmade gifts which mean so much to people, so we decided to ask them to share those stories”, says Ilana Rabinowitz, VP of Marketing for Lion Brand Yarn Company. The winner will be announced on the Facebook page on the week of April 30th. Additionally, the winner’s story will be shared on the company’s blog, the “Lion Brand Notebook” (blog.lionbrand.com), which receives about 230,000 monthly views. Founded in New York City, Lion Brand Yarn Company is a 134 year-old brand and America’s oldest hand-knitting yarn brand. Throughout its history, Lion Brand has been at the forefront of yarn trends while consistently providing its customers with the finest quality products at affordable prices. Visit LionBrand.com.